In this conversation, independent consultant Michael Eaton describes the challenges developers face estimating software projects. He then describes approaches to these challenges, based on his experience. Recently, I was asked to migrate code from one source control repository to another. The customer had been using Visual Source Safe (VSS) for many years and had dozens (maybe hundreds) of projects checked in. Most of these projects had a long history of file versions. VSS was a decent product when it was first released, but it falls far short of newer source control systems, such as Team Foundation Server (TFS), Subversion and CVS. This customer selected TFS as their new source control system, but they did not want to lose the history they had captured in VSS. Migrating years of source control can take a really long time, maybe weeks. You will probably want to do a test migration of your data, which will extend the time requirement even further. If you have been checking code into a source control system for any length of time, there are bound to be some mistakes: Projects that were started but never went anywhere; Code changes that were mistakenly checked in and had to be reverted; and duplicate source code erroneously checked into two distinct folders. If you migrate your all source code history, these mistakes will be migrated as well. Repeat this for each solution. You will now have a current version of all relevant code checked you’re your new source control system. Some users will tell you this is not enough. These users want to keep all the history of every bit of code - every version, every branch and every project. Using the above migration strategy, you can still do that. My recommendation is to keep the history in your old repository, mark that repository as read-only and leave it online. Users will still be able to use this old source control system to find their old code, but will use the new source control system for all version control going forward. This is far simpler and faster than trying to push years of changes into a new repository. The lesson here is: Always consider the simplest alternative and determine whether it meets your needs, before considering more complex solutions. In this episode, Jay Harris discusses the challenges integration code from different team members and how Continuous Integration can help solve these challenges. 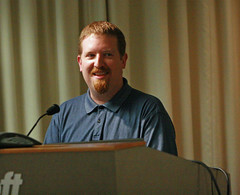 Chris Woodruff organized the 2009 Grand Rapids Give Camp which helped dozens of charities with software projects. On the final day of the Give Camp, Chris sat down with us to describe what went into the camp and what was accomplished. By any measure, this past weekend's Grand Rapids Give Camp was a big success. 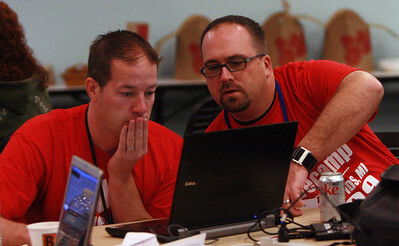 Over 70 volunteers worked at the Grand Rapids YMCA to build software projects for dozens of charities. Most of the volunteers were technical people - Developers, Database Administrators and Designers - but some came to assist with the logistics. In additions, local companies provided food, drink, facilities, giveaways. Projects ranged from new web sites to automated contact management systems. Chris Woodruff, who coordinated the event was impressed with the quality of the work he saw. "We have such a great technical community, so (getting volunteers) was the easiest part," said Woodruff. When it was all over, the charity representatives were happy and several declared that the delivery exceeded their expectations. Speaking commitments and family emergencies have kept me from fully engaging in past Give Camps, so this was the first one in which I contributed the entire weekend. My team created a web site for the Kent County 4-H Council, which they can easily update without hiring a technical resource. You can see the site at http://kentcounty4hcouncil.com/. Woodruff is already thinking about next year's event, which will likely be held in July on the same weekend as a similar event in ann arbor. The October 2009 Great Lakes Area .Net User Group featured Sogeti principal consultant Jesse Murray speaking about The SharePoint, a talk that was originally titled "SharePoint - The Right Way". For many in the audience, this was a first look at developing solutions in SharePoint and the challenges of this development. Here is a recording of that presentation. Stephen Toub, lead Program Manager on the Microsoft Parallel Computing Platform team, sat down with us to discuss the reasons why parallel computing is important, the challenges in writing code to take advantage of multiple cores, and what Microsoft is doing to make it easier for developers to write this code. I remember how excited I was in the early days of .Net when I discovered how easy it was to write a Windows Service. I probably wrote a half dozen services that first year. But I hadn't written one in years and (oddly) hadn't even heard anyone talking about writing a Windows service in as long. Perhaps the reason one hears so little about Windows Services is because the way we write them has changed so little since .Net 1.0. A Windows Service is not dependent on a particular user being logged in. In fact, a Windows Service can run if no one is currently logged onto the machine on which it is running. This makes a Windows Service inherently more secure than a Windows Forms application or a Console application because you can run it on a server, set credentials and log out of the console. To create a Windows Service, open Visual Studio and select File | New Project. In the Project Types tree of the New Project dialog, expand either Visual C# or Visual Basic node and select the Windows node. In the Templates area of the dialog, select Windows Service. Set the Name, Location and Solution as you would any other project and click OK to create the project. By default, a Windows service contains one class named "Service1". The name of this class isn't really important because it isn't called externally, so I always leave this default name. If you double-click this class in the Solution Explorer, it opens in a Design view. Select View | Code to switch to a code view of the class. Notice that the class inherits from ServiceBase and that it contains overrides of two methods: OnStart and OnStop. As you might guess, OnStart contains code that runs when a service starts and OnStop contains code that runs when a service stops. I put setup code into OnStart, such as initializing variables that my service will need. I generally put very little code in the OnStop method, but this is where cleanup code goes. Services are designed for long-running processes and are meant to stay in memory for a long time -sometimes months or years. Most of the services I've written use a timer object to periodically wake up and perform some check and respond if that check finds something. For example, you might check the contents of a folder every 10 minutes and, if an XML file is found in that folder, move it to a new location and parse it appropriately. For example I recently wanted a program that would check an error log every few minutes and automatically attempt to correct any errors found there. I had already written a class to read the error log, retry each error found and remove from the log any errors that were retried successfully. So my service only needed to call this class every 5 minutes. I used a timer class to do this. A partial code listing is shown below. // Wake up and perform some action. I prefer to keep the code in the service to a minimum and abstract complex logic to a separate assembly. This makes testing and debugging easier. So the omitted code in the above example would call out to another assembly to do the hard work. In order to install a service, you will need to add an Installer class. Select Project | Add New Item; then select the Installer Class template. This class also opens in the designer by default. Select View | Code to see the code. The Installer class inherits from Installer, but you don't need to override any methods. ServiceInstaller ServiceInstallerServiceName The name of the service. This must match the ServiceName specified in WindowsService1. ServiceInstaller DisplayName A name displayed in the Services Manager applet. ServiceProcessInstaller Account A built-in account under which the service will run. ServiceProcessInstaller Username The name of the user account under which the service will run. ServiceProcessInstaller Password The password of the user account under which the service will run. For the ServiceProcessInstaller, you will set either the Account property or the UserName and Password properties. Typically, I set the Account property to System.ServiceProcess.ServiceAccount.LocalSystem, so that it can be installed. This account probably won't have sufficient privileges to accomplish what my code is trying to do, so someone will need to open the Services Manager and change this to a valid account. I could hard-code the Name and Password of an account that I know has sufficient privileges, but this ties my application too tightly to a single domain or server or organization. I would rather keep it flexible enough that it can run anywhere. And besides, the account under which a service runs is really a deployment issue, so others should be making these decisions and they should be forced to think about this at deployment time. si.ServiceName = "DGWinSvc"; // this must match the ServiceName specified in Service1. si.DisplayName = "DGWinSvc"; // this will be displayed in the Services Manager. spi.Account = System.ServiceProcess.ServiceAccount.LocalSystem; // run under the system account. Now open the Services Manager applet (under Windows Administrative Tools) and refresh the list of services. You should see your service listed with the DisplayName you assigned in the Installer class. Right-click this service and select Properties to display the Service Properties dialog. Click the "Log On" tab, select "A particular user" and enter the name and password of the user under which this service should run. You may need to create this user. It should have permission to access all resources that the service needs to access. Click the OK button to save these changes and close the dialog. Of course, you can also write a setup project to your solution if you want to automate the deployment process. This article does not cover that. where <ServiceName> s the ServiceInstaller ServiceName property specified in our installer class. For our example, we would type. This is a useful if you want to script the starting and stopping of your service. Windows Services are something that .Net got right very early and hasn't needed to change. Creating useful services is easy with the .Net framework. You can download a simple Windows service at DGWinSvc.zip (28.05 KB).